LIFTcell industrializes the Additive Building Process from Manufacturing to Production.It has never been as easy as now to join true Additive Production. Balzers, Liechtenstein (April 11, 2017) – Coobx (http://www.coobx.com), the Liechtenstein based additive manufacturing company, today announced the launch of LIFTcell production lines, which make the change from Additive Manufacturing to Additive Production reality. To reach customer demands on quantities there are three different units with different grades of automation. 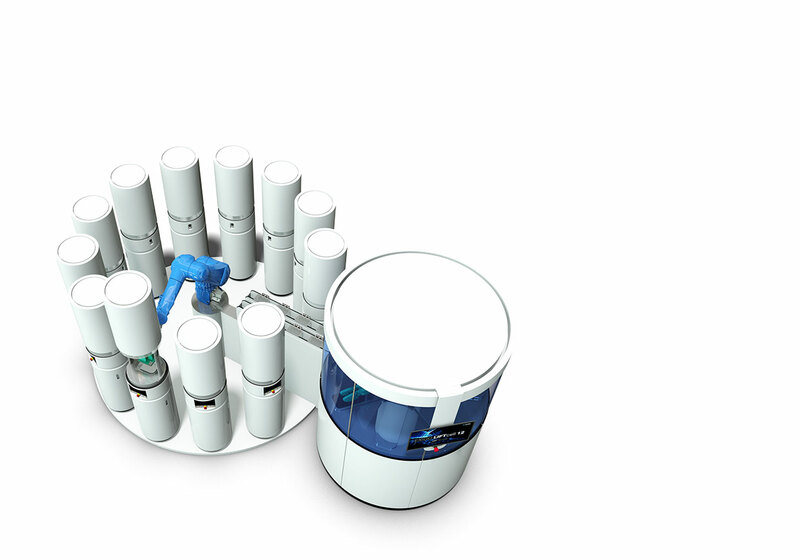 The LIFTcell 2 makes the step to automated 3D production as easy as never before. An fully automatic Pick&Place system organizes the continouos production of up to 60 build platforms. To get a smooth workflow, the resin in the printers will be adjusted and refille automatically by two CIP (clean in place) hose pumps. The system is designed for up to two printers. The printers can also be supplied with two different materials. The integrated job spooler organises the print jobs. This solution is thought as entry level system for automated production, but can together with the LIFT®-Technology already convince with an high output and reliability. The Post-processing will be done manually by the known EXIGO Clean&Cure unit. For true industrial and mass production the LIFTcell 8 & LIFTcell 12 systems have been designed. This is a fully automated workflow including a high output rotary transfer based Post-processing unit, which can clean, cure, dry, temper or collect resin. The single steps are defined accordingly the process needs and can be reorganised in a modular way. The high speed rotary transfer system allow to process build platforms with 150 second cycle time. To give as much as possible flexibility, the LIFTcell handles up to 6 different materials on a maximum of 12 machines in a unit. The resins are stored and processed in the central unit and are easy to handle. The most actual Staubli TX2 robotics guarantee a true industrial workflow and a maximum reliability. The central printserver organizes all printjobs. 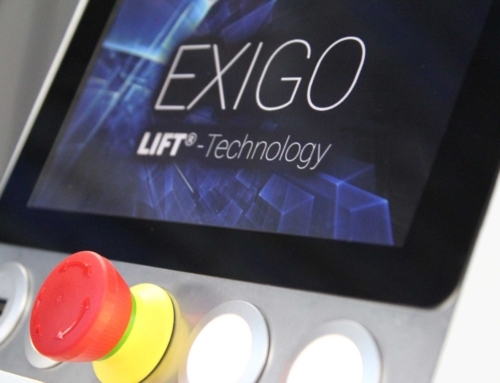 “LIFTcell is the logic extension of the EXIGO printer series. Having really fast single printers is a curse and a saviour at the same time. Changing every 20 minutes building platforms and handling them in a non qualified post process, has nothing to do with Additive Production. We had the modular, automatisable systems already in mind during the design process of the EXIGO printers. We are proud to show up now the high productivity solutions for the industry.”said Marco Schmid, Coobx CEO and head of R&D. Every LIFTcell version can be equipped with the standard EXIGO 1-110 or EXIGO 1-350 and can be also mixed up in one unit. So all known advantages from the EXIGO printers are included. High volume production quantities with a maximum of flexibility are no more future. Together with a qualified process and a minium footprint, the LIFTcell is ready for production. Coobx – Be different. Think further. Coobx, which is based in Balzers, Liechtenstein, is in the field of Additive Manufacturing solutions for light initiated materials. With our patent pending LIFT®-Technology (Light Initiated Fabrication Technology) we are setting an industry standard. Absolutely new dimensions in the range of materials, speed and accuracy are now possible. As a strong partner for turnkey solutions we do provide and implement all the needed steps into your manufacturing process. So additive produced parts are getting reality and are no more only in the stage of prototyping. With our EXIGO series machines we can provide from the standalone single machine to the fully automated production line all the range, to make your workflow as smooth and scalable as possible. The fabrication begins not in the machine and doesn’t end in the machine, so we have developed all necessery addons to realize qualified production processes. Over 20 years experience in designing and producing machines, components and automation systems for the semiconductor and machine tools industry, helped us to invent and develop our disruptive LIFT®-Technology.